This year, Gardeners’ Guild has been honored with two prestigious awards this year for its work on a full-scale landscape renovation for a home in the Oakland Hills. The national award, presented by the Professional Landcare Network (PLANET) is a first-place award in its category. The California Landscape Contractors Association (CLCA) presented the state award at their annual convention in San Diego. Both associations receive numerous entries every year and recognize a select number of contractors with an award ceremony, featuring a multi-media show that highlights winners’ achievements followed by the presentation of award plaques. Being recognized nationally for their work is a significant accomplishment for a landscape contractor and the team at Gardeners’ Guild was jubilant when the news arrived. The property’s setting is impressive. 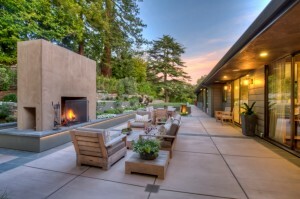 Located high in the Oakland hills with sweeping San Francisco bay views, the landscape renovation was conceived to harmonize with the mid-century modern style of the newly renovated house, and for their family to have more outdoor living space. The new landscape was a complete transformation in which Gardeners’ Guild installed an outdoor kitchen, fireplace, spa and custom-built water feature and terraces, which were cut to maximize the beauty of the sloping hillside.